The Ilyushin Il-46 was a jet-engined bomber produced in the USSR during 1951-2, as the result of a directive to re-design the Il-42 project (half the drawings had already been completed). The revised specification was for an aircraft with twice the range and one and a half times the bomb load, with a prototype ready to be submitted for state acceptance trials in July 1952. 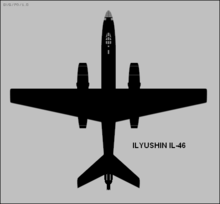 The Ilyushin design bureau set about designing two versions of the same aircraft, straight winged (Il-46) and swept winged (Il-46S), with as much as possible common to both aircraft. To meet the schedule for State acceptance trials Ilyushin only built the straight winged version, fearing that the design, manufacture and flying characteristics of the swept winged aircraft might cause delays. The airframe, constructed of aluminium alloy with steel used in highly stressed parts, resembled a large Il-28, the long fuselage having swept tail surfaces, and a similar arrangement of cockpits for the crew of pilot, navigator and rear gunner. The wing, which had moderate taper but straight leading edge, copied the layout of the Il-28, being mounted in the shoulder position at the mid point of the fuselage. The flying controls consisted of the usual ailerons, elevators and rudder, all fitted with trim tabs for reducing loads on the pilots controls during flight in steady states, as well as "reversible" hydraulically powered actuators. Two Lyul'ka AL-5 engines were fitted in long nacelles forward of the wings, exhausting through long jetpipes at the rear of the nacelles, aft of the wing trailing edge. The engines were mounted in this fashion to make room for the retracted main undercarriage legs, two on each side attached to the engine nacelles under the wings. The paired main undercarriage legs, side by side, retracted in opposite directions, inboard forwards and outboard rearwards, with the single mainwheels rotating 90 degrees to lie flat under the long jetpipes of the AL-5 engines. To boost take-off performance two JATO bottles could be attached to the rear fuselage, performance was also improved when Lyulka AL-5F (forseerovannyy - afterburning) engines were fitted. Flight tests and State acceptance trials were successful, with the Il-46 meeting all requirements. Production was not ordered because the Tupolev Tu-88 proved to have better performance, and was ordered into production as the Tu-16. The Il-46S swept winged version was designed concurrently, but construction was not started to ensure that resources were not diverted from the Il-46. 2 x 23 mm Nudelman-Rikhter NR-23 cannon in an Il-K6 turret at the rear of the fuselage. Gordon, Yefim (2004). OKB Ilyushin. London: Ian Allan. "Il-46/Il-46S, S.V.Ilyushin". Russian Aviation Museum. http://www.ctrl-c.liu.se/misc/ram/il-46.html. Retrieved 2008-11-04.